This is what I have been getting ready for. I had come to feel that a picture could have incorporated in it the structural design implied in abstraction and be presented in a wholly realistic manner. Every age manifests itself by some external evidence. In a period such as ours when only a comparatively few individuals seem to be given to religion, some form other than the Gothic cathedral must be found. Industry concerns the greatest numbers––it may be true, as has been said, that our factories are our substitute for religious expression. We no longer have the innocence of this time, but now see the very negative effects on our planet by industrialization, of both factory and farm. 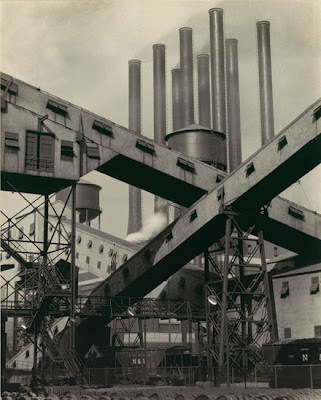 But for Sheeler, the grand American landscape was not a pristine mountain, but a large complex factory, showing a particular austere beauty, and speaking of promise. Fortune magazine commissioned Sheeler to produce a series of six paintings on the subject of Power. 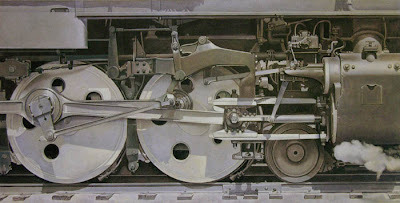 He painted a hydroelectric plant, a steam turbine, the Hoover/Boulder Dam, but his most famous image from this series is Rolling Power, a detailed study of the wheels of a locomotive. The feeling of immense power is palpable, but at the same time the image is pristine, with none of the wear and tear of reality; it is more the ideal of a machine, its abstract elements emphasized by the horizontality of the composition. 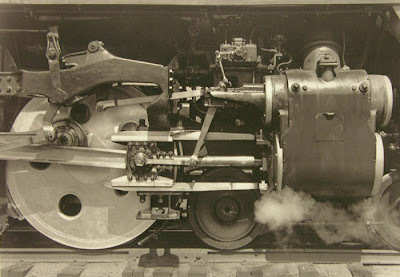 You can see that Sheeler relied heavily on the photographic source, but the painting has a character unique to its medium: it is beyond the real. 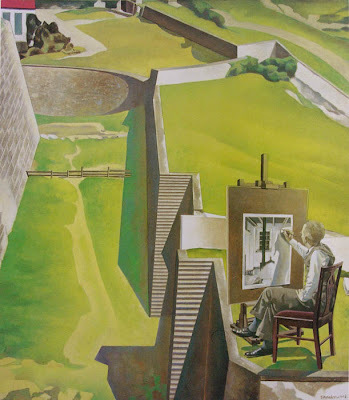 I want to end with this quirky painting of Sheeler at his easel, working on a painting based on the photograph at the beginning of this post, shot many years before, of the stove at the Doylestown house. But he is perched high above a strange, almost surreal landscape of walls surrounding inaccessible spaces. 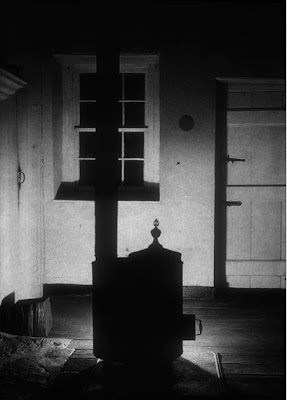 I see this as Sheeler's statement that art always comes from the artist's imagination, no matter that she is looking at something outside herself; that thing is out of reach in a philosophical sense, in that we can never truly know "the thing in itself", but only its appearance. Therefore the search for abstraction, to give each thing weight beyond its surface. and it's great to see these images again. I agree: what a beautiful last sentence. Thanks too for this reminder. 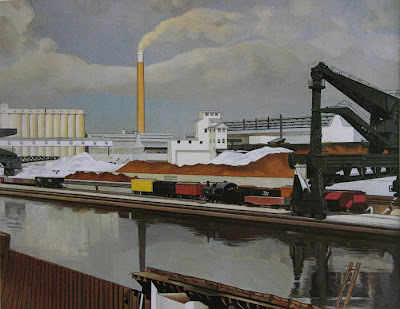 Despite my obvious prejudice, I have always preferred Sheeler's photos so glad you included that odd nature ptg. Which has always cast such a spell. I can see why he would be important for you. Thank you both for commenting on the last sentence of this post. I must admit that it was something of a surprise for me, to write that. I'd been thinking about this post for a few days, and knew I was going to include "The Artist Looks at Nature", and approximately what I was going to say about it. Then, as I was writing, Kant's "thing in itself" came to me as relevant to our search as artists, and to questions of realism and abstraction. What a fabulous post Altoon. i think I cold quite happily come to a weekly session in which you introduce an artist to the group each week and give full measure of their unique vision, influences, ideas and achievements over a lifetime. I would look forward to the reading you give of their vision and contribution...and your thoughts beyond that! Wonderful sweep of a life and yet so succinct! Ms. Wis, what a contrast between Sheeler's vision and what has become of Detroit's auto industry. I don't think we'll ever again have an unabashedly positive view of any thing that is manufactured. Glad you enjoyed the post Sophie. I like writing about artists and works that move me, and have done it quite a lot: if I add up all the posts on art history, contemporary art, photography, film, and writing, it must average out to one a week. As spring advances, though, I imagine I'll be focusing more on the garden and a bit less on art.